As most of you that have known me for any amount of time, I am a HUGE Back To The Future fan. If any of doubt that, these two blog posts should prove that to you. 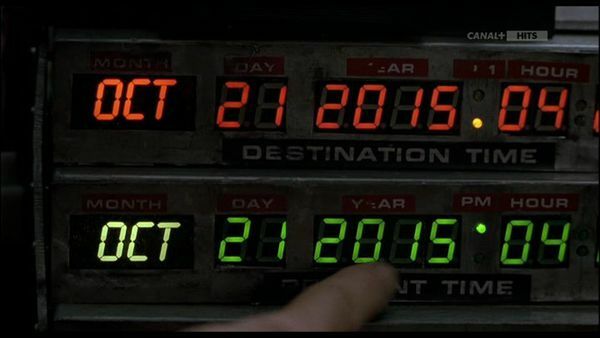 So as October 21, 2015 is almost here, I am waiting for that magic moment – 4:29pm – when the DeLorean made it’s way from 1985 to 2015. Since Part II came out in 1989, it’s been quite the wait over the last 26 years. There’s so many things that we don’t have that the movie included, first and foremost, the flying cars. Hover boards and self-lacing Nike shoes are kind of available, but not widely available. Very excited to experience the date. See you next Wednesday when we arrive Back To The Future. You like BTTF? Who knew?